I never thought I’d be writing a blog about anything, but especially not one about hunting. This former member of PETA recently has had some very exciting, beautiful, and amazing experiences tagging along with my chukar hunting husband and surrogate four-legged child in Idaho’s backcountry. The chukar (Alectoris chukar) is a wild game bird first introduced into the western United Sates in the 1930s. They live on steep, rocky hillsides and tend to be found towards the tops of ridges. 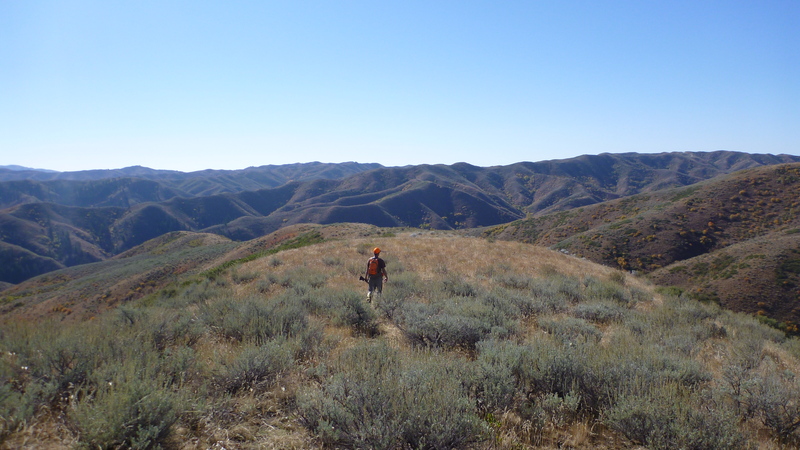 Our secret hunting spots are close to Boise and have expansive hillsides of Cheat grass and sage brush. The chukar like this type of terrain which resembles their native habitat in India, Pakistan, and Afghanistan. Chukar hunting is very demanding physically. Imagine going up and down super steep stairs for hours but with rocks, loose dirt and sagebrush to navigate around. Do all of this while trying to stay up with your very athletic dog. When I can stop and catch my breath, I pull out my camera, take some shots and then try to catch up again to the hunter and dog. It’s exhausting, and complainers and can’t-hack-its won’t be invited back. 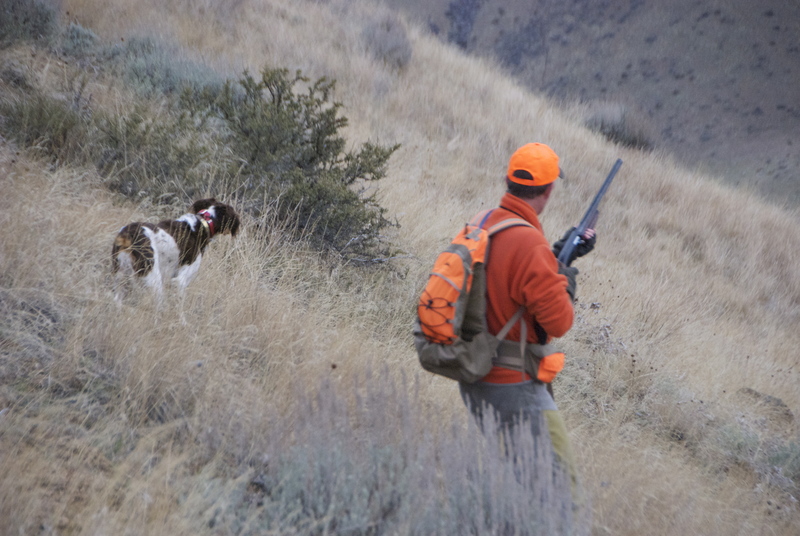 Besides the extreme exercise, chukar hunting appeals to me because I enjoy watching our 4-year-old Brittany (Angus) doing what comes naturally to him: finding a covey of chukar and pointing them. Once he finds them, Angus will remain motionless until we flush them. The fast birds usually fly downhill and if we’re lucky Bob manages to shoot one or two. Angus then will try to find the downed birds and bring them back up to us. His success rate retrieving dead or wounded birds is about 98%. Without him, since the birds are the same color as the terrain, and because our noses have only a tiny fraction of Angus’s sensitivity, our retrieval rate would be about 5%. This grueling activity itself is Angus’s reward; he tells us in many ways that it’s his favorite thing in the world. For us, it’s a lot of work to find 100% naturally organic bird to cook up but it’s totally worth it. 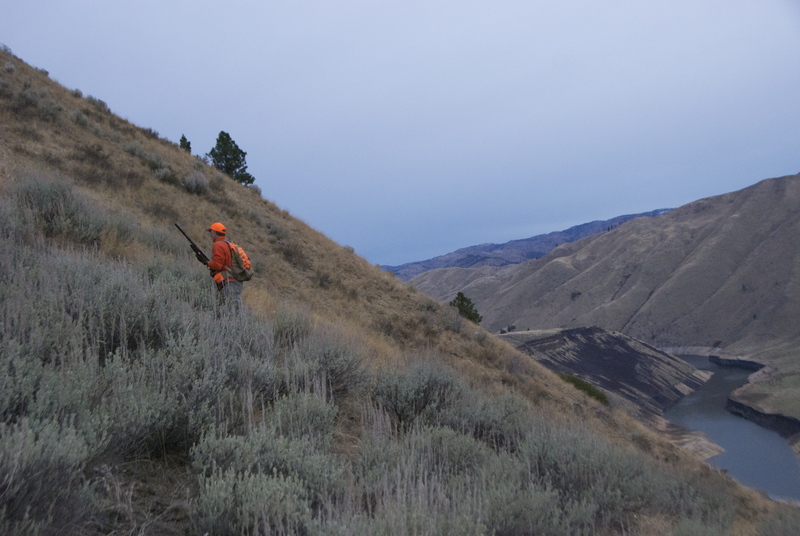 Chukar hunting is not just about the birds. A good day is just being outside, quietly hiking off trail and discovering the views from the top of the mountain while breathing the fresh air. I was going to go into more detail about the birds themselves and details about hunting them but my husband beat me to it and created an entire blog on the subject. For more information, photos and videos you can find the link at www.chukarhunting.wordpress.com. 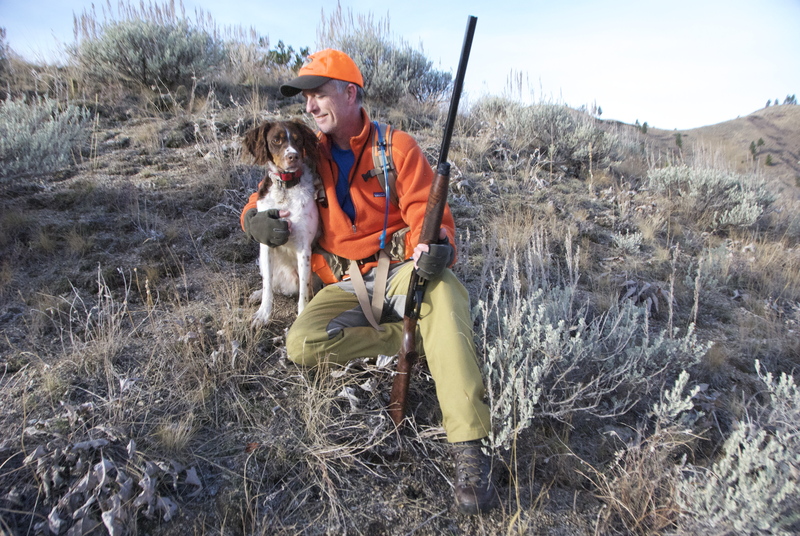 Chukar hunting season ends in Idaho on January 31st. We were hoping to get out there again one more time before the end of the season but our winter finally arrived Jan 19th. Chukar hunting in the snow is possible but the birds will be super stressed enough as it is trying to find cover after this big storm. We’ll just have to patiently wait until September to chase them up and down the mountains again.